How Marijuana became an illegal substance in Canada is a fascinating story. 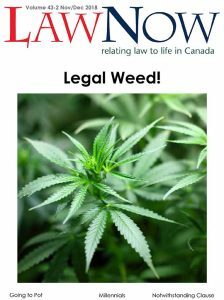 Here is a summary of what Canadians need to know about the new Cannabis Act. There are lots of issues that employers and employees must grapple with as they come to terms with Canada’s new law. Can you smoke cannabis in your rental accommodation or condo? It’s complicated! A brief summary of how the various sales and excise taxes will apply to cannabis products. Millennials are driving the growth of the sharing economy. Taxes are an important factor for them to consider. Millennials in Vancouver and Toronto are feeling the pain of record high real estate prices and rents.